The medical wing in Cellblock 3 at the Eastern State Penitentiary. "The coughs were a symptom of tuberculosis, common in the nation's general population and at epidemic levels in prisons worldwide in the 19th and 20th centuries. Eastern State opened in 1829. Its construction cost of $780,00 made it one of the costliest buildings in the United States. It opened with central heating and running water, earlier than those conveniences were available at the White House. Fifty years later, a cell block was opened to provide medical treatment. In May, that cell block, swept out but without renovations and still open to drafts and rainfall through uncovered ceiling apertures, opened for inclusion in the visitor's tour. In the mid-19th century, said Matt Murphy, tour program supervisor at the Eastern State historic site, prisoners with tuberculosis were put on special diets, ordered to perform moderate exercise and soaked in cold baths. Tours of the hospital cell, or Cell Block 3, have been sold out during hardhat walkthroughs for several years. Stabilization of walls and ceilings now permit it to be included in the regular tour and staff conduct specialized programs several times daily, as they do for other sections, including a synagogue and the kitchen. You can see a tub in one of the cells now open for viewing. You also can see the cots with their metal straps that supported mattresses of some sort, and toilets in the corner by the door with open bars. Unlike solid sliding wooden doors in other cell wings, those in the hospital section were built with metal bars to facilitate ventilation. “Before antibiotics, there was no cure for tuberculosis,” said Murphy. “This was advanced care for the time,” he said. “Some people came into prison with the disease. The requirement for solitary (confinement) was relaxing because of growing prison population and prisoners were beginning to share cells. It was dark and damp and crowded. Coughs and sneezes filled the air,” he said. Across the country, tuberculosis was fatal in one of every five cases, said Murphy. “At Eastern State and at other prisons, tuberculosis was the greatest health concern. Today it's mental-health issues,” said Murphy. Tuberculosis wasn't the only health problem that was treated in the hospital. In addition to a mix of injuries from fights and work mishaps, inmates battled typhoid, colds and rashes, and sexually transmitted diseases, especially syphilis. Prison records show that most inmates were admitted with the sexual diseases, Murphy said during a 40-minute tour of the hospital wing. 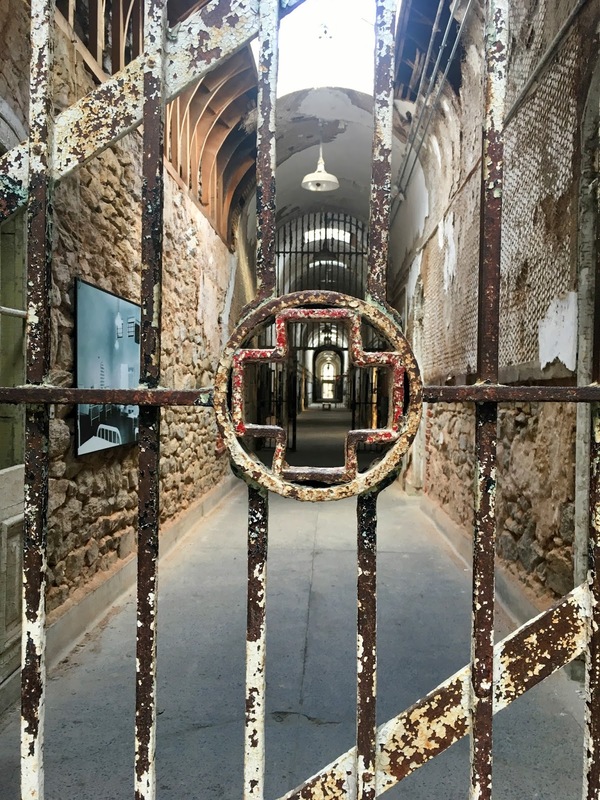 Treatment for serious medical conditions continued at Eastern State until the 1960s, when transfers began to hospital units in other state prisons. Solitary confinement for general population inmates had continued until 1931. Traces of the extent of loneliness that went with solitary confinement are still present in some sections of the prison, like square holes in the wall, used to slide meals to inmates denied even that small contact with another person. By the mid-20th century, Murphy said, treatment of psychiatric problems was getting more sophisticated and counselors joined the prison staff. “Solitary confinement was hard on the mind,” Murphy said. An operating room on the tour, with four large circular lights still in place over a metal operating table, opened in 1910. By 1960, the medical staff was performing about 300 operations a year. Staff included a plastic surgeon. Patients who used the operating room included gangster Al Capone, who had his tonsils removed at the state's expense after his incarceration in Philadelphia began in 1929. “Then it wasn't all rusty and crusty, like Dr. Frankenstein,” Murphy said. Even with a special room, conditions were far from sanitary by today's standards, since the square design easily collected dirt in corners. Before 1910, operations were done in the prisoner's cell."